Here’s my motivation for prioritizing fitness in February: I can satisfy my post-workout hunger with crawfish and king cake. And it seems like the rest of the city is on the same page. 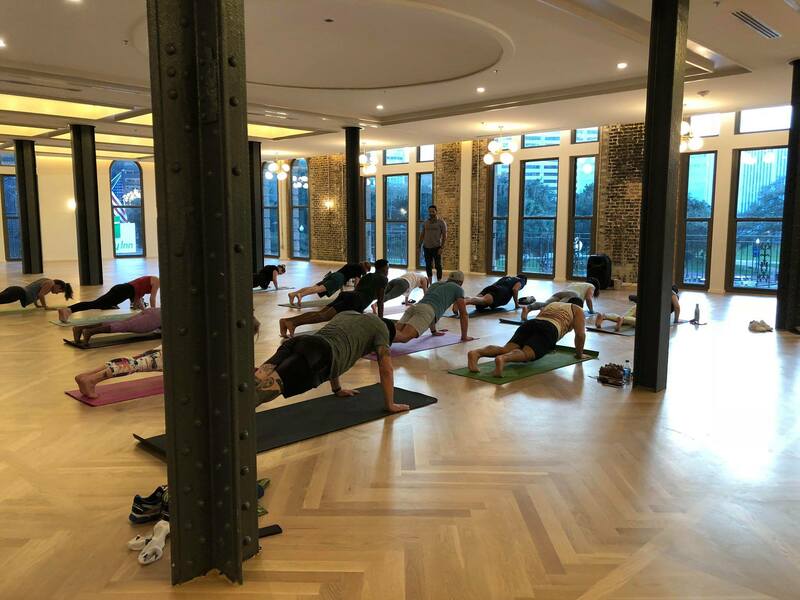 This month’s fitness classes include races with performances by New Orleans bands along the course, and yoga classes concluding with Mardi Gras parade-watching. 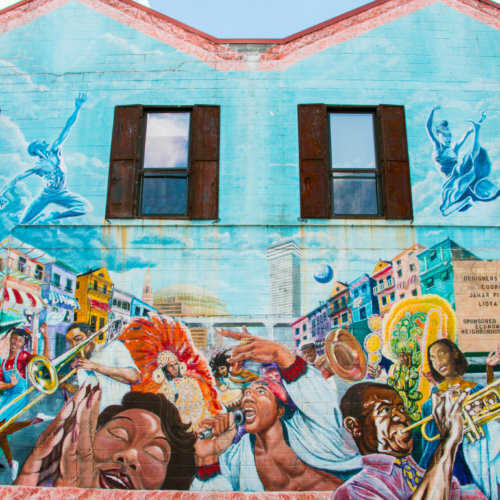 February has never been a better time to get sweaty in New Orleans. You’ve likely heard of The Boycott Bowl, the New Orleans protest to the Super Bowl. But have you heard of Boycott Bolt? 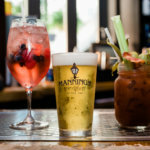 This 3.2 mile run starts as Ms. Mae’s, a classic New Orleans dive bar, and makes stops at various local haunts along the way: Dat Dog, Tracey’s, and Courtyard Brewing. The finish line is Boycott Bowl on Fulton Street, where a lineup of New Orleans musicians will perform to celebrate the Saints’ amazing season. When: Sunday, Feb. 3, 4 p.m.
Where: Ms. Mae’s, 4336 Magazine St. 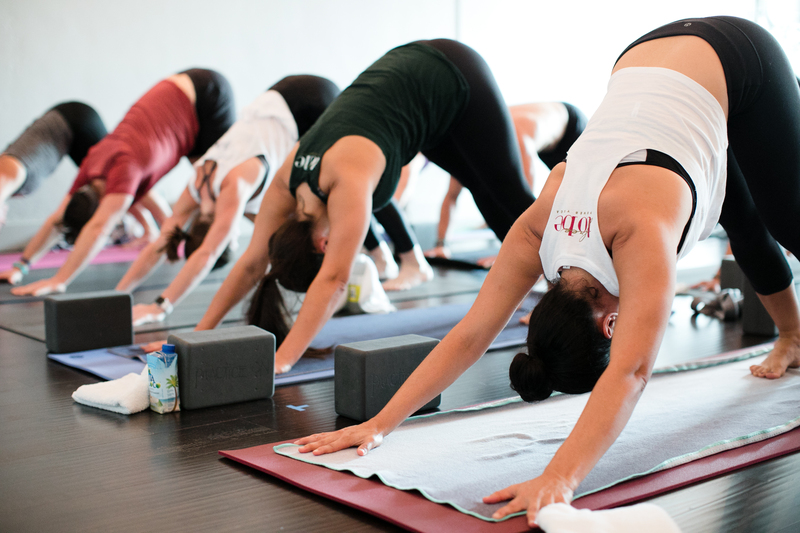 Earn your Saturday brunch with this sweaty, all-levels yoga flow hosted in Laurenia, the upstairs event space at The Pythian Market. This market is a food lover’s dream, with 13 culinary vendors that range from traditional Southern fare to Middle Eastern dishes, all set in a gorgeously-renovated food hall in downtown New Orleans. After yoga, meander downstairs for the market’s Saturday Jazz Brunch for drink specials and a live local jazz band. 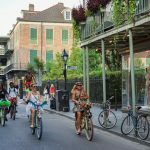 When: Saturday, Feb. 9 and 23, 10:30 a.m.
Where: Pythian Market, 234 Loyola Ave.
Get ready for runners from all around the world to take over the streets of New Orleans. The annual Rock ‘n’ Roll Marathon is hosting four different races on Saturday, Feb. 9 and Sunday, Feb. 10, including a 5K, 10K, half-marathon and full marathon. Each race includes cheer stations with energetic music to keep you motivated along the route. The best part? The marathon after party is headlined by Preservation Hall Jazz Band, a local New Orleans favorite. 5K Race: Saturday, Feb. 9, 8 a.m.
10K Race: Sunday, Feb. 10, 7 a.m.
Half-Marathon and Marathon: Sunday, Feb. 10 , 7:30 a.m.
5K Starting Line: St. Charles Ave. & N. Maestri St.
10K Starting Line: St. Charles Ave. & Girod St.
Half-Marathon and Marathon Starting Line: Poydras St. at Camp St. Admission: Register for all races here. Sweat out a weekend of indulgences at Romney Studio’s Monday evening cycle class, called RIDE. Located in the studio’s multi-story fitness hub nestled on Magazine Street, this high energy class is set to motivational music in a dimly lit room so you can focus on your ride. What’s more, The Monday community class is affordable at $12 and is a wonderful way to reset for the week. This class fills up quickly, so make sure you register in advance here. When: Monday, Feb. 4, 11, 18, 25, 6:30 p.m.
Where: Romney Studios, 5619 Magazine St. Admission: $12. Classes fill up quickly. Register in advance here. 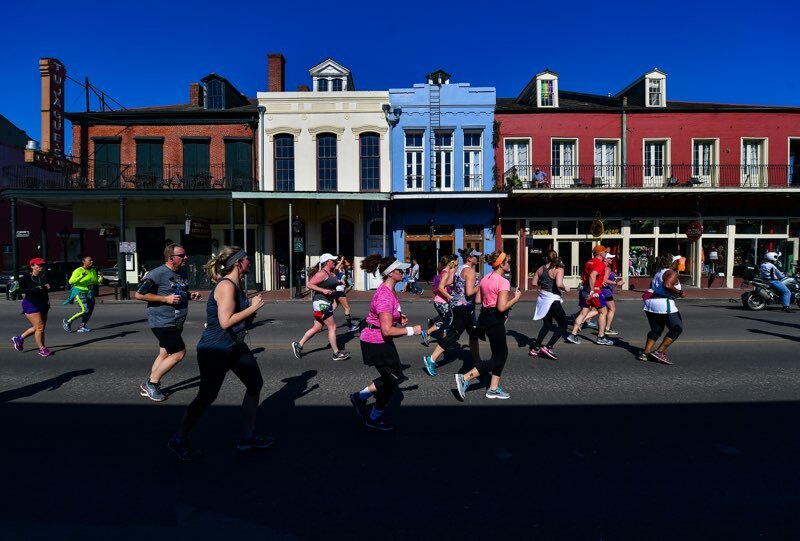 Dubbed the world’s longest 5K since the course is technically a touch longer at 5.04K, this annual race takes place in Crescent Park, an immaculately landscaped strip of greenery that runs along the Mississippi River in the Bywater and Marigny. As you run alongside New Orleanians of every age, high school marching bands perform along the route. Your race fee benefits a great cause — Youth Run NOLA’s programs that empower youth through running. When: Saturday, Feb. 16, 8:30 a.m.
Where: Crescent Park, 2400 North Peters St. Admission: $30. Register in advance here. Where will you watch the Krewe of Nyx Parade? At Free To Be Power Yoga, perhaps? of course. Stationed directly on the parade route, Free To Be hosts an annual Mardi Gras Flow followed by communal parade watching. First, practice yoga in a heated black light class with glow in the dark body paint and joyous carnival tunes. Then, recharge with complimentary king cake and drinks in the foyer. Next, catch a Nyx purse, one of the hand-decorated, coveted throws procured only at this parade. 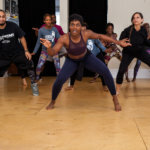 When: Wednesday, Feb. 27, 6 p.m.
Where: Free To Be Power Yoga New Orleans, 4609 Magazine St.
Move Ya Brass is a fun, funky fitness and lifestyle group in New Orleans that is a community of people from all walks of life. Come as a stranger, leave as family is their motto. 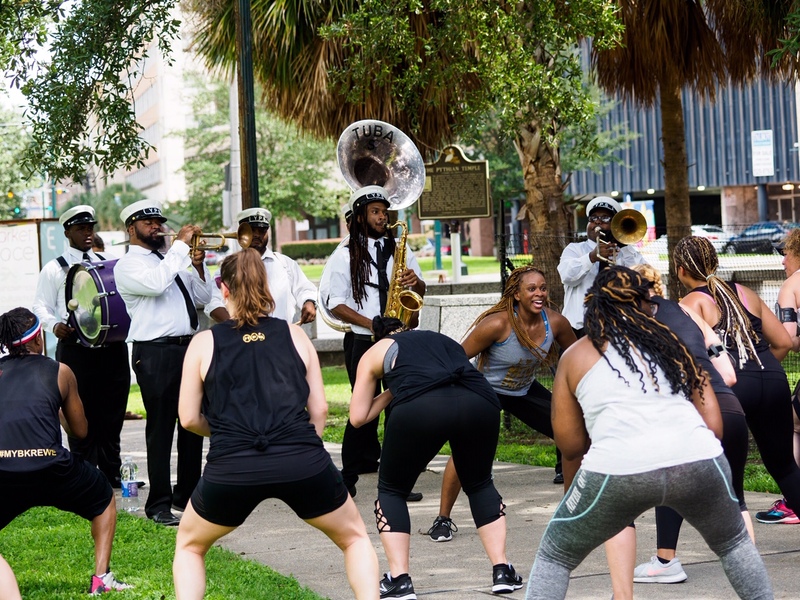 Founded by New Orleans native and musician Robin Barnes, otherwise known as “The Songbird of New Orleans”, Move Ya Brass is a fun, music focused fitness family that embodies the spirit of New Orleans. Join their krewe all February long (except February 28-the Thursday before Mardi Gras) at any one these classes. For a full list of their classes, visit the Move Ya Brass class schedule here. When: Every Monday in February at 6 p.m. When: Every Tuesday in February at 5:45 p.m.